Bixler’s Lodge was built as a barn in the mid-1800’s and was owned by the Krammer Organization. The barn housed an old-style, hand-pumped fire truck for the Krammer Factory located across the stream. It also housed animals and was used for farming. From 1903 to 1906 The John Babb family owned the property. For a short time in 1907 it was owned by the Eckert family and Deppen Brewing Company. In 1907, the Stony Creek Mills Building Association purchased and owned the property until 1931 when James Bixler, Sr. bought the barn. For a short time, hoedowns were held upstairs for entertainment. 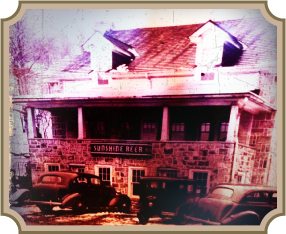 However, with the help of local stonemasons and carpenters, it was transformed into Bixler’s Lodge in 1934. At that time, local people would bring in stuffed animals, rifles, and handguns to display and hang from the wooden beams. The Bixler family sold the property in 1981 to Joseph and Helen Quaglia. The Quaglias continued Bixler’s tradition until 1989 when Scott Woodward purchased the establishment. Mr. Woodward enlisted the partnership of Brian Hartman in 1991 and continued serving the Stony Creek and Reading areas. In 1993, Brian and Doreen Hartman became the owners of Bixler’s Lodge. With over 70 years of serving fine foods and drinks, we believe Bixler’s Lodge to be one of the oldest historical restaurants in the Reading area and hope to continue the fine tradition for many years to come.